Ingersoll’s series 45D…RP solid carbide roughing endmills give you the optimal solution for all roughing operations. This series covers a wide range of applications including slotting, pocketing, helical interpolation and contouring. 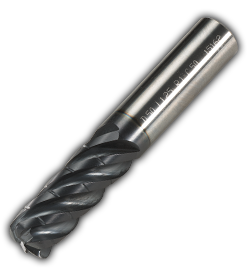 Features and Benefits • 4- and 5-flutes with 38° and large corner radii • An endmill that provides the highest advantage in cavity milling and heavy roughing cuts • The serrated cutting edge features flat peaks which leave a better surface finish when compared to competitors’ roughing endmills. 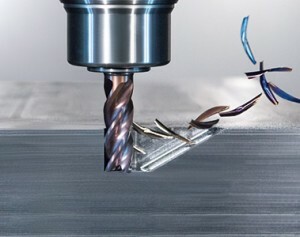 For customers with constantly changing tool requirements and a high demand for machining flexibility, Guhring has developed a new Ratio endmill that covers five operations with one carbide endmill tool: RF 100 Diver carbide endmill can perform drilling, ramping, slotting, roughing and finishing operations. Apart from its diversity the Ratio carbide endmill convinces with outstanding cutting values, as application examples prove. Furthermore, the RF 100 Diver carbide endmill establishes new standards for plunging: Guhring introduces this innovative multi‐functional carbide endmill that is able to plunge up to a ramping angle of 45°.